"If this was a political censorship decision, it is terrifying." 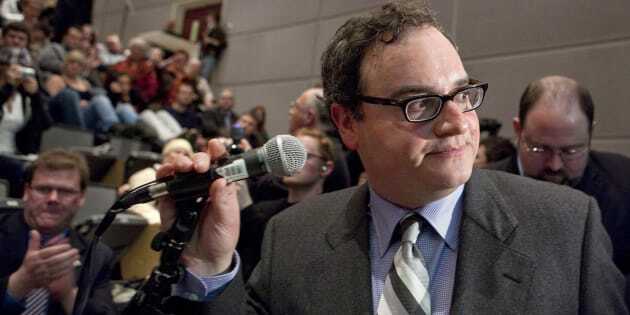 Right-wing political commentator Ezra Levant is shown at the University of Ottawa in Ottawa on March 23, 2010. TORONTO (Reuters) - Canada's conservative Rebel Media said a technology company stopped directing traffic to its website, making it inaccessible to some users around the world on Monday as the site known for tirades against Muslims and refugees scrambled to get back online. Last week GoDaddy Inc, Alphabet Inc's Google and other technology companies pushed the neo-Nazi website Daily Stormer offline by terminating services to the online publication, which helped organize a white nationalist rally that turned violent in Virginia on Aug. 12. Rebel Media founder Ezra Levant said he was given 24 hours' notice and no explanation for the action. He did not identify the technology company. "If this was a political censorship decision, it is terrifying - like a phone company telling you it is cancelling your phone number on 24 hours notice because it doesn't like your conversations," Levant told Reuters. He said the site was still available in "about half of the world." Rebel Media has faced sharp criticism for what was considered overly sympathetic coverage of a white-supremacist demonstration in Charlottesville, Virginia earlier this month at which a woman was killed when a man plowed a car into a group of counter-protesters. Levant responded by attempting to distance The Rebel from the far-right movement. He fired Faith Goldy in the aftermath of Charlottesville, after she participated in a podcast on Daily Stormer, the neo-Nazi site that other technology firms pushed offline last week. Goldy captured dramatic footage of the attack that left a 32-year-old woman dead and 19 injured while she was streaming live video from Charlottesville for Rebel. Levant, a lawyer and media personality who founded the outlet as "your fearless source of news, opinion and activism" in February 2015, had previously been a prime-time host on Sun News Network, a short-lived Canadian cable channel dubbed "Fox News North" by its critics that shuttered after four years of operation amid poor ratings. Several other contributors have left the online publication over the past week and some prominent conservative Canada politicians have also sought to distance themselves from the site, according to media reports. The defections include co-founder Brian Lilley, who according to the Globe and Media was uncomfortable with the site's increasing harsh tone and growing association with the likes of white nationalist Richard Spencer. The national leader of the Conservative opposition party Andrew Scheer told CBC News he would not give interviews to The Rebel with its current editorial direction. Norwegian Cruise Line Holdings Ltd last week canceled plans to host a cruise for Rebelsupporters, according to the Independent newspaper and a group that petitioned against the booking. The company did not response to a request for comment. Levant said traffic to the site had risen in the past week, but did not provide specific numbers.Rebel's main YouTube channel has more than 850,000 subscribers.